The Hotel Cruz de la Victoria is located in El Berrón, in an unbeatable location, in the center of Asturias. El Berrón is a town belonging to the parish of La Carrera, in the Asturian council of Siero. It is located 3.1 km from Pola de Siero and 13 from Oviedo. Its population is 3,315 inhabitants. 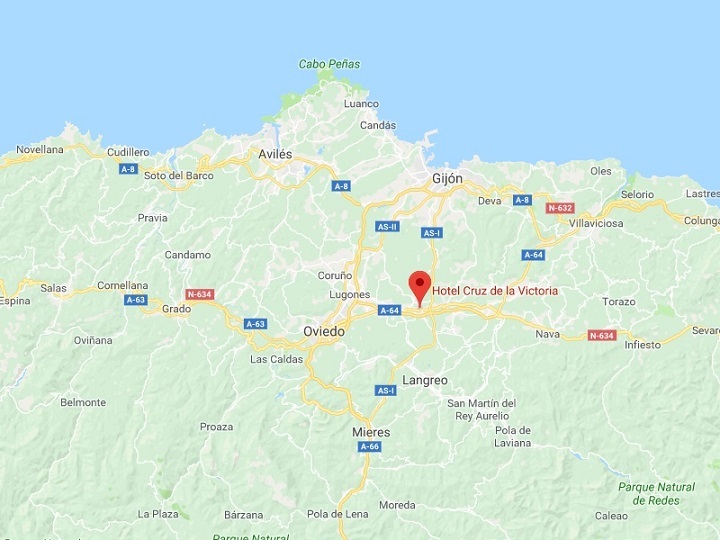 The Hotel is only 10 minutes from Oviedo and Gijón, and 20 minutes from Avilés. This town is also an obligatory point of passage on the Way of Saint James in the stage from Pola de Siero to Oviedo, forming part of El Camino del Norte, which runs from Irún, crossing the Cantabrian coast to Ribadeo, at the entrance to Galicia , where the itinerary turns southwest towards Compostela. Much of it goes through tourist areas, and combines highly urbanized stretches with others of great natural beauty, generating great traffic of pilgrims.